Ever since I learned how to make my own homemade bread, I have not stopped baking them :) reasons being homemade ones taste better and I can have more healthier ones . I love making them as they present a sort of therapy for me, I find that it is relaxing for me. The joy seeing it proofing and the smell of freshly baked breads is a form of aromatherapy for me :) I don't know why but it is really good for me. I love the smell and when the buns turned out great....that joy , I can tell you , money cannot exchanged for it :) I know at times I am long winded but seriously, making bread has a therapeutic effect on me and I find it soothe my soul whenever I am stressed over my work project. For me Stress equals to Buns LOL! I have a bottle of kumquat compote in the fridge and I turned them into jam for my freshly baked Poppy Seeds buns. I used the same dough recipe which I made recently for the Corn & Bacon Rolled Bread, for these cute little Poppy Seed Buns. 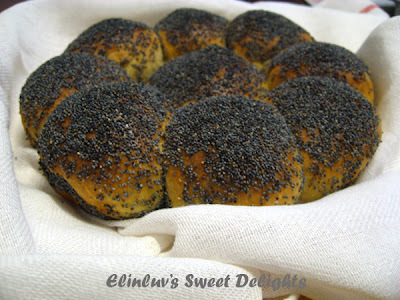 Instead of rolled bread, I made them into small buns and laced them with poppy seeds. 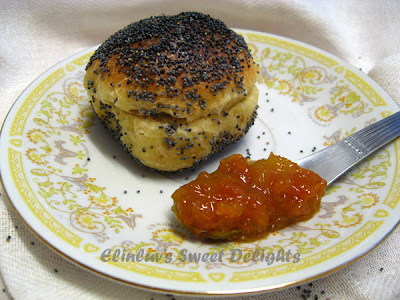 I know when you hear poppy seeds - you would say " what ! poppy seeds - heroin " , but I assure you that it is highly nutritious and is highly recommended to pregnant mothers and new mothers. Poppy seed is an oilseed obtained from the opium poppy. The tiny kidney shaped seeds have been harvested from dired seed pods by barious civilizations for thousands of years. And these seeds are used, whole or ground, as a ingredient in may foods, and they are pressed to yield poppyseed oil. The most desirable come from Holland and are a slate-blue color. The color of poppy seeds is important in some uses. 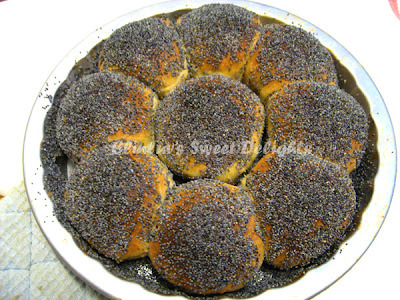 White poppy seeds are preferred if used as thickeners. 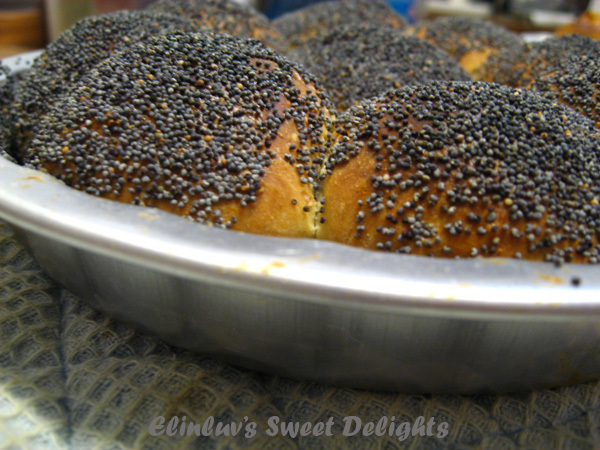 In cakes and bread, black poppy seeds are preferred for maximum impact. They are normally used to laced on bagels, hamburgers bun and bread for extra crunchy. seriously, I don't mind having them every morning ! I have turned lazy nowadays, keke. I agree with you completely. Bread making is addictive. You poppy seeds bread must have tasted awesome. 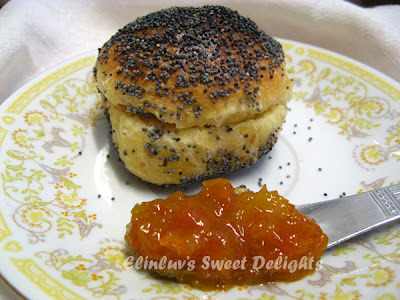 I think poppy seeds are banned in S'pore. Aunty Yochana had the Narcotics officers visited her, when she posted a recipe using poppy seed. Wow! 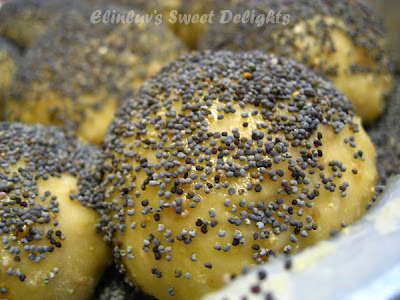 can get high eating so much poppy seeds? lol! Looks yummy! Jeannie....haha, yea ..no wonder our heads went shaking non stop...just kidding ...the poppy seeds gave the bun a nice texture and it bursts in our mouth :) awesome on the bun! i just made some buns today too..but it was quite a time consumimg one. YOu reminded m eto i need to make some kamquat compote soon! Wow, so much poppy seeds. Bet the bun must be very crunchy! 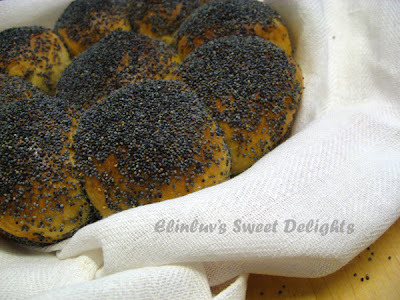 Hi hi, where can you buy poppy seeds in Malaysia? I am interested to try its taste. Kym Kym....it is not banned in Malaysia so I guess any shop selling baking ingredients will have them. I bought mine from ' Yummy Kitchen Bake & Dine, 21, Lorong Tmn Ipoh Satu, Tmn Ipoh Selatan,31400, Ipoh. Your buns look wonderful! You are right about making bread, there's "a feel good happiness" about successful bread making! Your kumquat jam looks really good! Elin, those poppy buns are gorgeous, esp. if you serve them with kumquat jam. Exquisite! Finally Josh Is In UK ! Turkey Holidays & Turkish Delight !